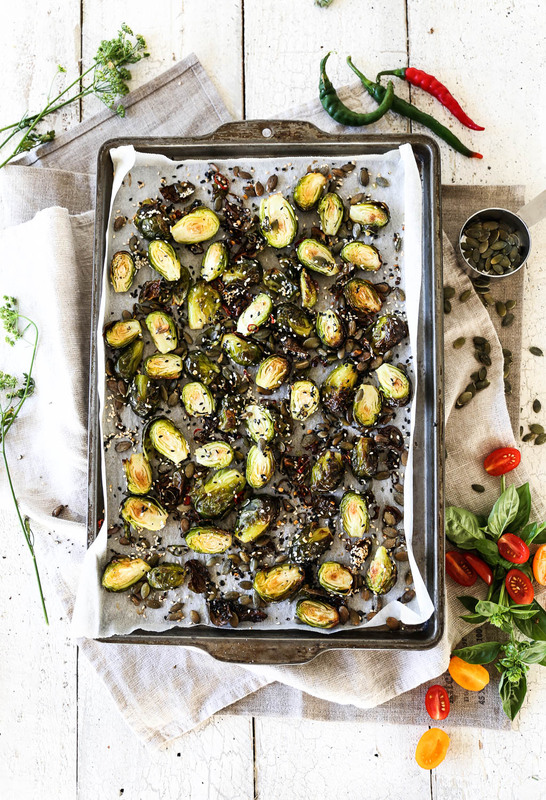 We never had Brussels sprouts growing up. Both mum and dad recalled bad experiences of being forced to eat boiled versions of them as children, and as a result swore never to put us through the same torture! So it wasn’t until I left home and went to university that I ended up trying them for the first time. To escape the mundane university hostel food, my friend and I would often venture out to restaurants around the city, which at that time was very small and populated mostly by students. One particular Saturday night we ended up at quite a flash (for our student means) bistro style restaurant, and to our dismay the accompanying greens for that evening were Brussels sprouts. The waiter, however, did such a stellar job at describing them that we agreed to try them. He convinced us that it was all in the preparation. And he was right! These particular Brussels sprouts were so amazing that I remember them to this day. The secret was roasting them as opposed to boiling. I think they probably also tossed them in butter and garlic, and sprinkled with toasted sesame seeds. Whatever their exact method was, it all came together beautifully and they had a delicious crunch. No soggy boiled sprouts in sight! Now that I know the secret, whenever Brussels sprouts are in season they feature heavily on our weekly menu. When I don’t have much time in the evening I simply roast them with a drizzle of oil, salt and pepper. When I have more time I throw in whatever I can find such as sesame seeds, pumpkin or sunflower seeds, sliced chilli, herbs and spices. As always, use the recipe below as a guide and feel free to mix it up with whatever else takes your fancy. They can be whipped up in minutes and can either be served on their own, or as an accompaniment to a main. They’re delicious eaten cold the next day, thrown into a salad or as a snack dipped in hummus or tahini! 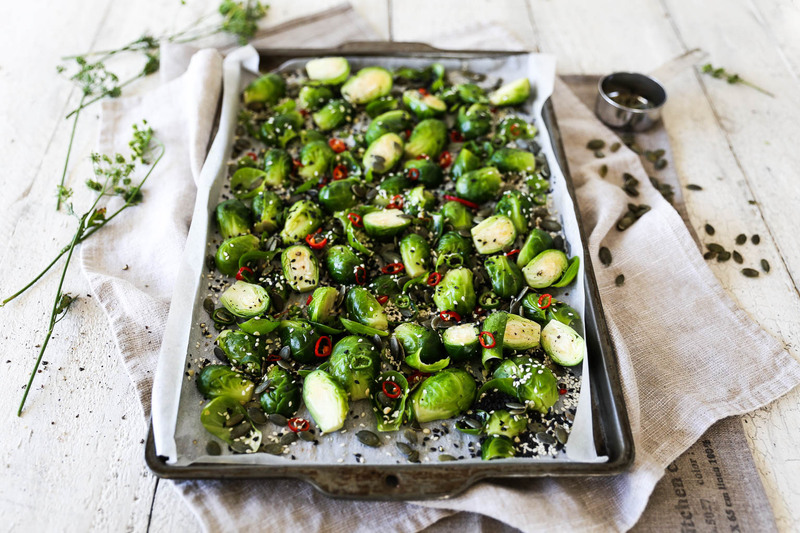 I hope you enjoy these little sprouts, and if you’re not already a sprout fan, perhaps this will be the dish that changes your mind! Enjoy. Preheat the oven to 170ºC fan bake and line an oven tray. Wash the brussels sprouts and drain well. Using a small knife trim off the ends and any brown bits. 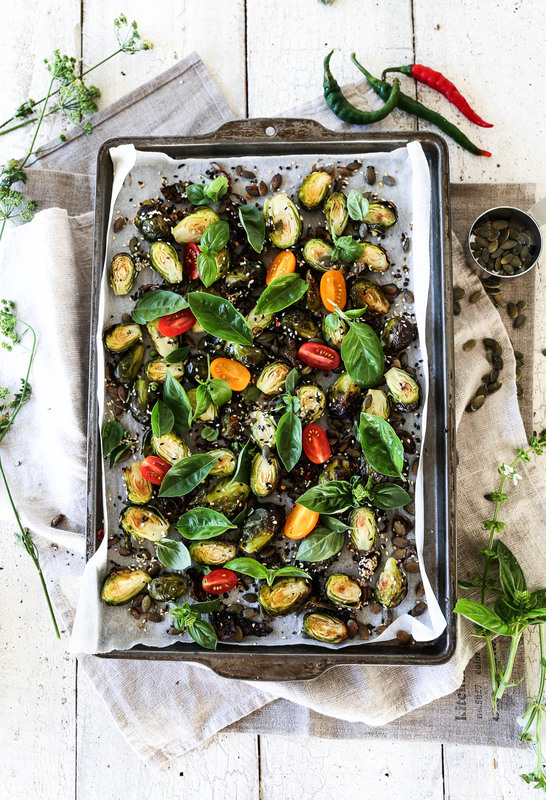 Cut each sprout in half and place on the lined tray along with any leaves that fall off (these crisp up nicely in the oven). Add the oil and toss until well coated. Season with salt & pepper, then sprinkle over the chille, sesame and seeds. 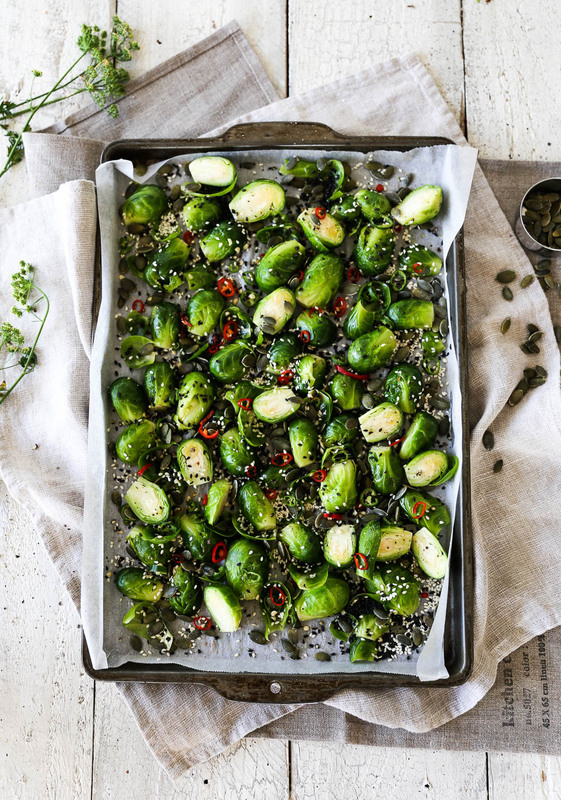 Place the tray of sprouts in the oven for 20 to 30 minutes. They’re ready when their edges turned a golden brown and are cooked through. Remove from the oven, garnish with fresh herbs and cherry tomatoes (if you wish) and serve the warm.